A couple weeks ago, while in my living room, I looked down at my ugly carpet…..and I decided I couldn’t stand my carpet any longer. Before I go any further with this post, I feel I need to explain why I chose that ugly, green-checked carpet. I visited a good friend many years ago when I was thinking about getting new carpet. She is an excellent interior decorator. She had a beautiful print Berber carpet in her house. The print on her carpet coordinated with her décor perfectly. Anyway, when I left her house…print Berber carpet was what I wanted. 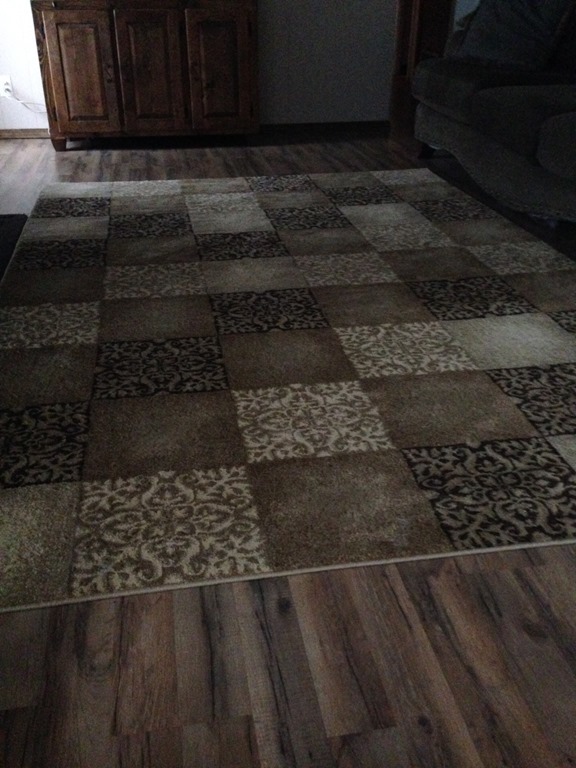 Right after the visit to my friends house, I chose this carpet because of it’s earth-tone colors. I was certain I made the right choice. 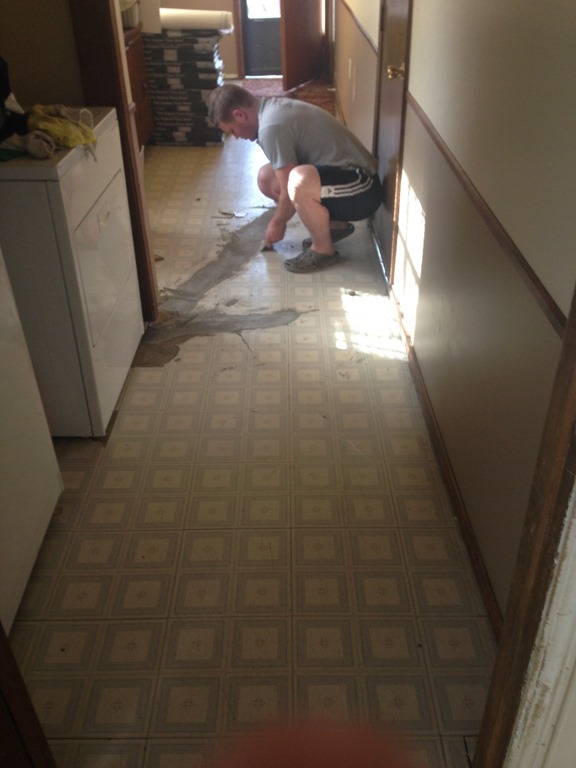 We spent around $2000 to have this carpet put in every room except the kitchen, dining room, and mud room. 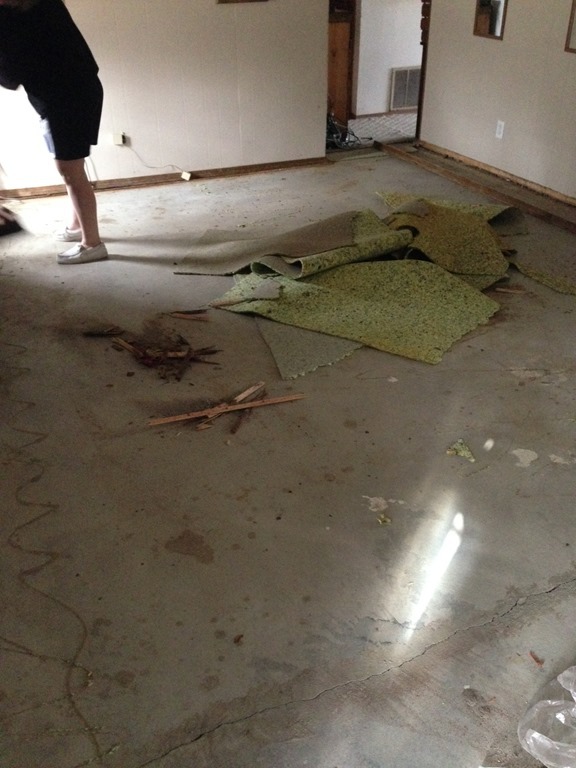 I was happy with my carpet choice….until the carpet guys starting putting in my house. I hated it from day one. And that was many years ago. I asked my oldest son if he would be willing to install the new flooring since his Dad is too busy for this type of project right now. He graciously said yes. He’s awesome like that. 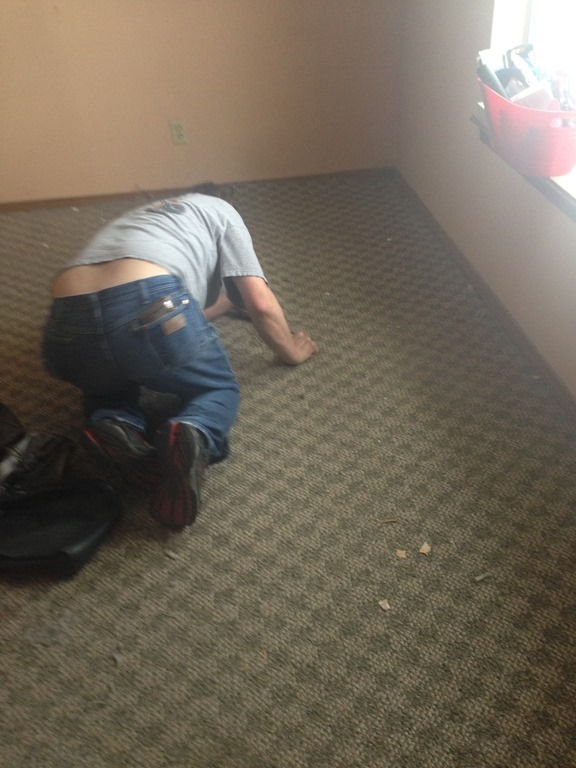 I didn’t think about getting a look-how-ugly-this-carpet-is-picture before he got started. But, if you look at where Clay is in the room, you can still see the carpet’s atrocious ugliness. This carpet has been down since my kids were young. 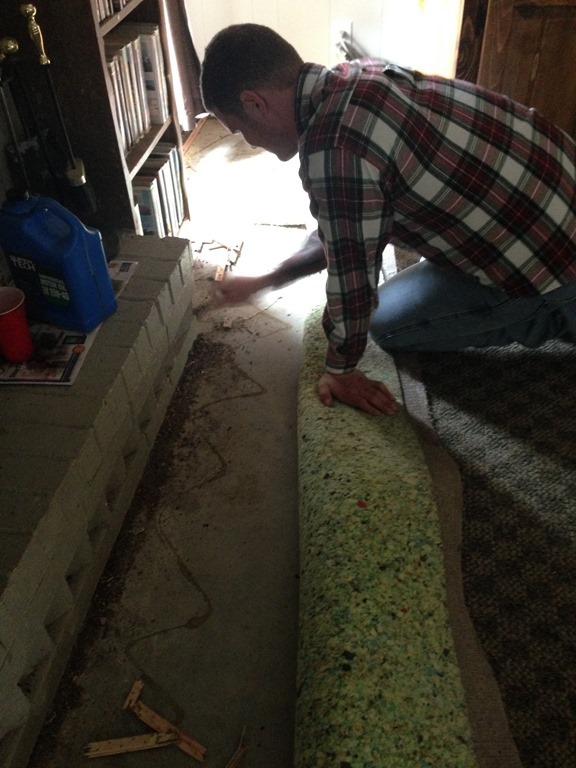 There was stuff under that carpet pad that would make you shudder in fear. How do LEGOs get under a carpet pad? 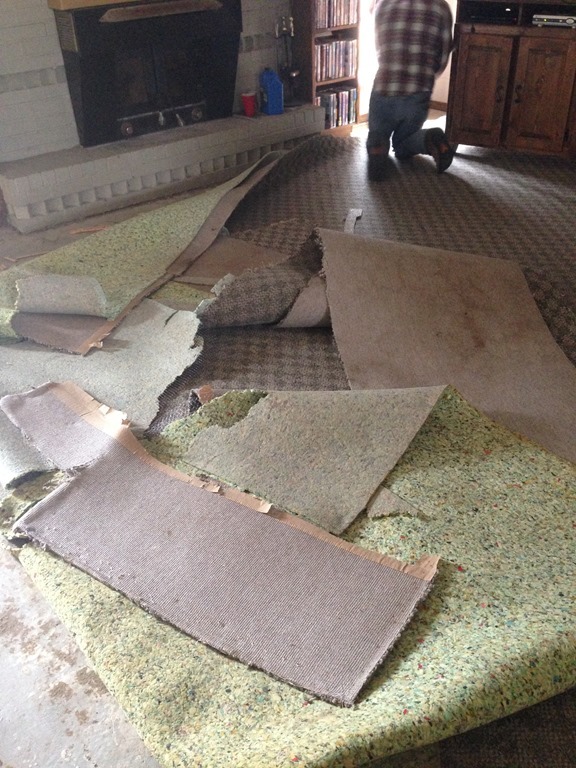 Anyway….nasty carpet gone. 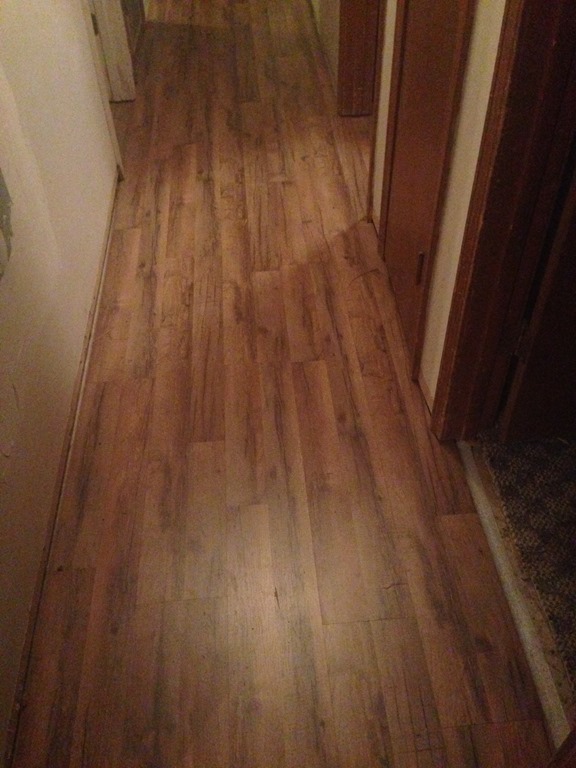 My new laminate wood flooring!!!!! Love. With my new rug purchased from Garden Ridge. I got it at 50% off!!!! Oh yeah…I forgot this picture. It shows the ugly of that carpet. This picture was taken on a Sunday. My hubby pulled up carpet in our bedroom on his only day off. Of course this was after he moved all the furniture. See the sack and trash bag? Let me tell you….I can stuff every nook and cranny in my house full of JUNK. I didn’t realize how much stuff I had acquired until I needed to move it. I have since hauled about 10 lawn bags full of stuff out of this house. And I’m not talking about little trash bags like the one in the picture. I’m talking about the bags that a six-foot-tall man can stand up in. Gee whiz…I’ve got to do a better job keeping stuff cleared away. Here’s a view of the hall. 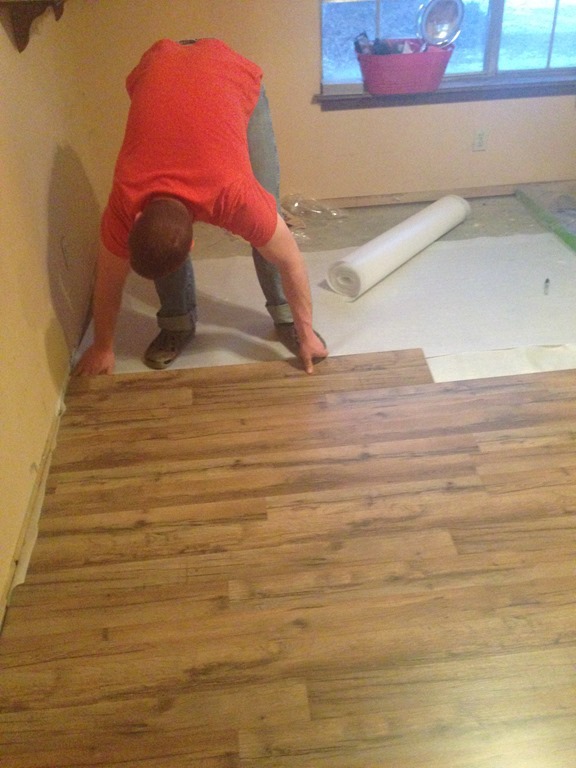 We decided to go with a vinyl flooring in the kitchen, dining room, pantry, and mud room. 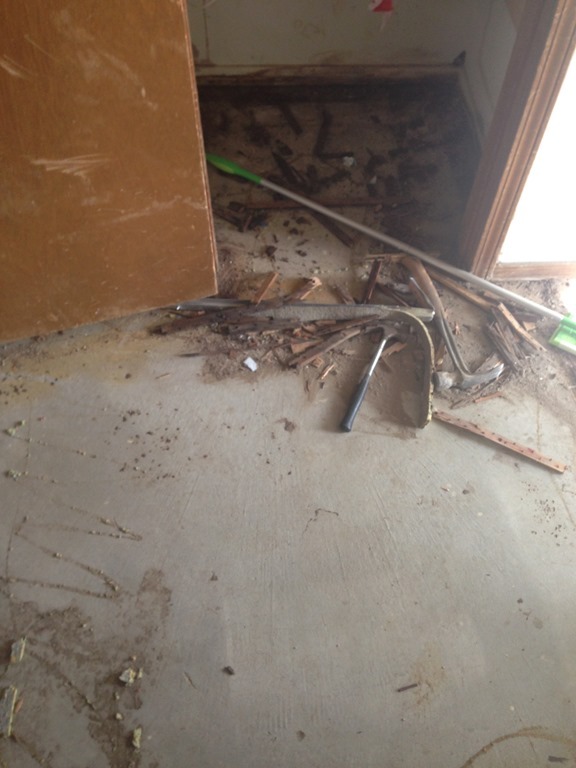 The above picture is my pantry after Clay pulled out the carpet. 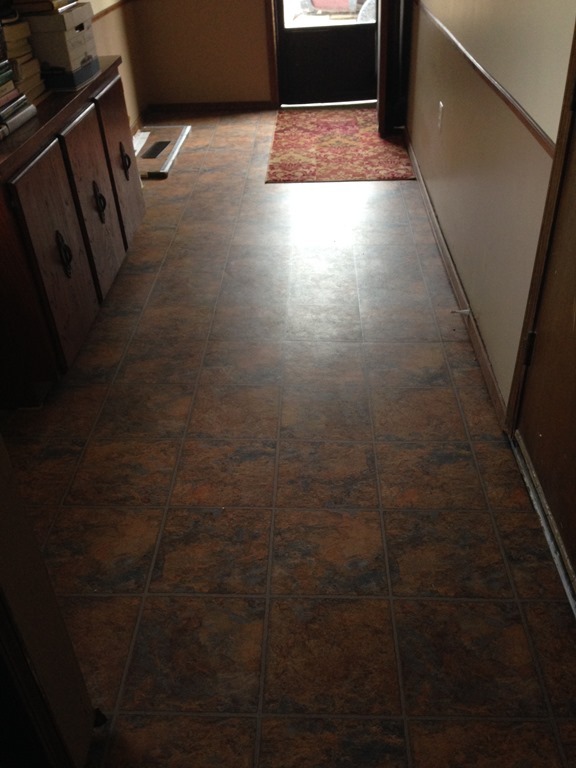 Same pantry with new organization and flooring!!!!! 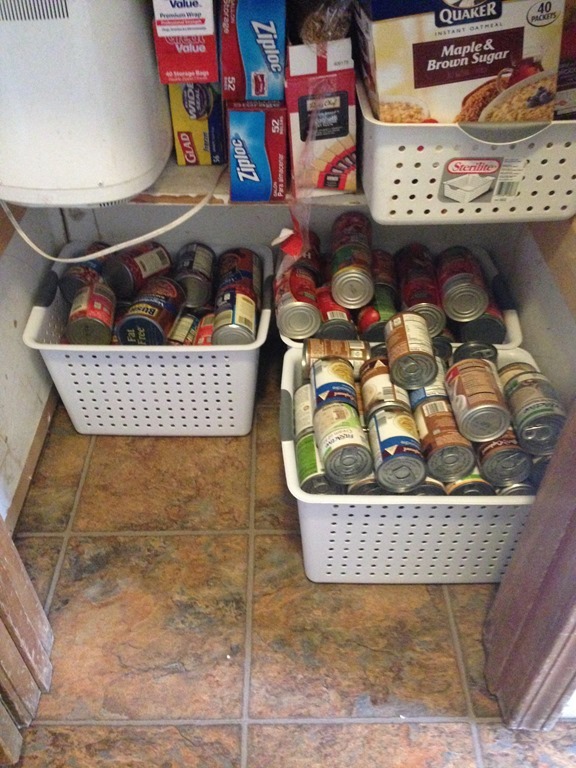 One bin has soups, one has canned tomatoes, and the other is canned beans. Getting the floors done has caused me to re-organize. 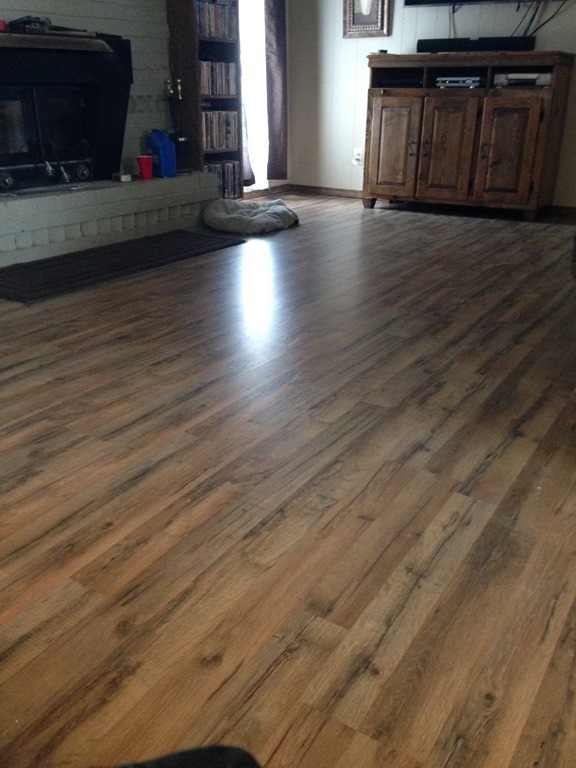 My floors are new, but my house is more pleasant to be in because it’s clean, organized, and free of clutter. This is my mud room with the old flooring. We had a ridge in the floor that had to be repaired. 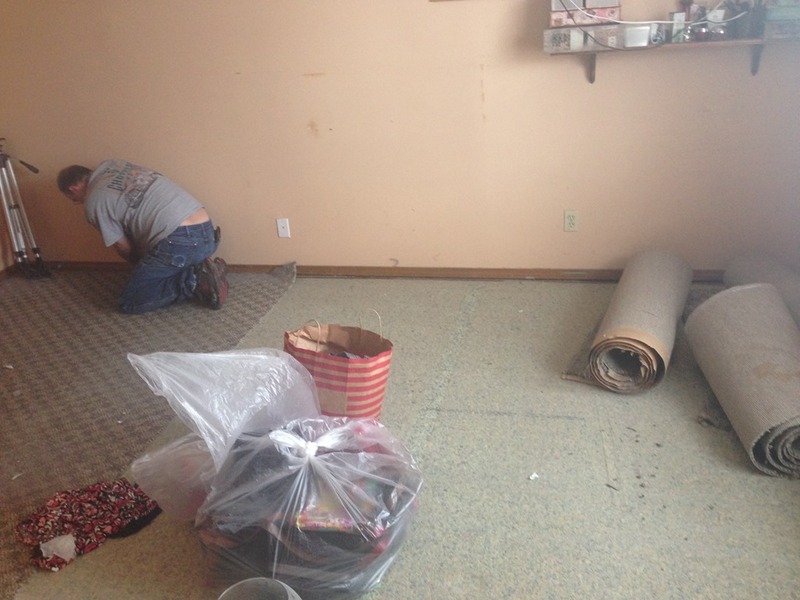 After we repaired and leveled the ridge, we put the vinyl tile on top of the old flooring. Same room with new floor. In a couple weeks, we are painting and remodeling my kitchen. This color of this flooring doesn’t match my white cabinets at all. If you can’t keep a secret…don’t read any further in this post. I don’t want the next part to get back to my husband. Ok? I mean it, this is top secret. I’m getting new stainless steel appliances. Hehehehehe..
Actually…I already mentioned the new appliances to my Hubby. He didn’t exactly jump for joy…but he didn’t say no either. I can’t decide if I should stay with an electric stove or go back to gas. If I had a gas range, I could cook with cast iron. I can’t decide. There will be an updated kitchen post coming in the near future. Whatcha think of my new flooring???? This entry was posted in Family and tagged family, home, life, remodel. Bookmark the permalink.